It's better late than ever !!!! I know I'm tad bit late but here I want to wish everyone a very ''Happy New Year''. I've been MIA for a quite long for some obvious reason and crazy schedule but finally I'm back and loads of product reviews and posts lined up along with 2013 favorites. I'm extremely thankful for Tmart.com for such a nice gesture and sponsoring an international giveaway. Tmart.com has orientated itself as a leading e-marketplace in the consumer electronics products industry, by offering customers with wide and better product selection, competitive price, superior pre-sale and after-sale services, and an efficient e-procurement platform to streamline the purchasing process. Tmart.com always pursues its on-going commitment "In an effort to provide our customers with the most innovative and efficient way to search and purchase the highest quality products in the most cost effective way." With low price, worldwide free shipping and superior customer service, Tmart.com is determined to exceed the expectations of every customer that visits its website. Do you want to be an elegant and charming lady? Beauty starts from an exquisite makeup brush set! Here I'm giving you a chance to win this exquisite 10pcs Professional Carbonized Bamboo Handle Cosmetic Makeup Brush to all of you beauties out there. 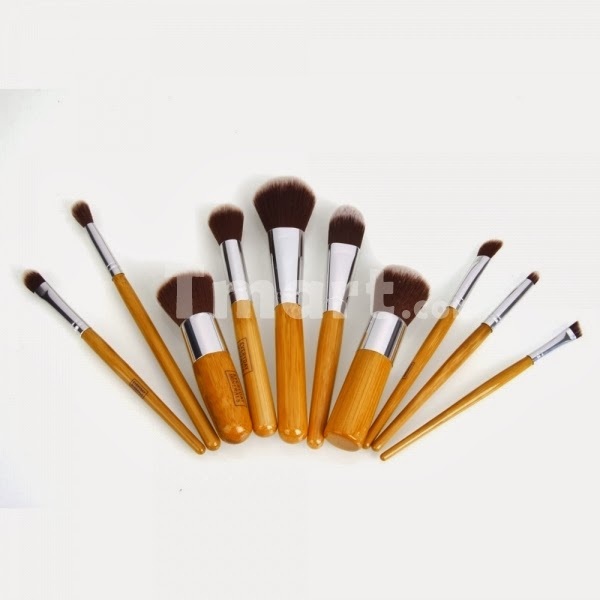 All the brushes for different parts of your face, such as lip, eyes, eyelash, eyebrow, cheeks, forehead, chin, etc, are all included in this set so that you can get a delicate make-up smoothly. Moreover, you do not need to worry about serious skin damage, for they are all made of soft and harmless material. Comfortable to hold and easy to use, these brushes will not let you down! I'll be choosing ONE winner randomly and they will be getting 10pcs Professional Carbonized Bamboo Handle Cosmetic Makeup Brush Set. How exciting is that?? Follow this blog via GFC publicly. 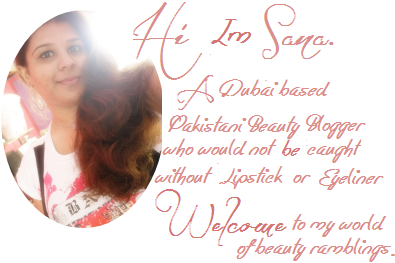 Follow Sana's Ramblings via Bloglovin'. Fill the Rafflecopter form below. The winner will be chosen randomly via random.org. Giveaway will end on 31 Jan 2014. 58 comments on "Win 10pcs Professional Carbonized Bamboo Handle Cosmetic Makeup Brush Set [International Giveaway]"
I want this kit badly. Participating soon. Great giveaway! My teen daughter just started wearing makeup and she asked for some good makeup brushes. I think she would love these. And have a fab weekend! I would love this makeup train case because I need one so badly and they are always so expensive! i like this because the prize is fantastic! I would love to have a set of these. They are nice to work with and look like a really good set. Good luck with your giveaway! love this pendant. Especially the peacock design is awesome. I love all the products of Tmart. Bamboo is of very nice quality! I like the look of these brushes, especially the handles. These handles look so smooth to handle. 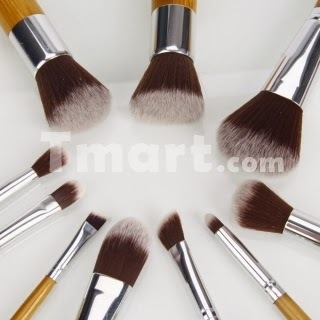 I'm curious about these brushes: http://www.tmart.com/18pcs-PV-Leather-Professional-Cosmetic-Makeup-Brush-Set-FC0407007_p192811.html they look really cute! It's cheap and it looks that it has a good quality! 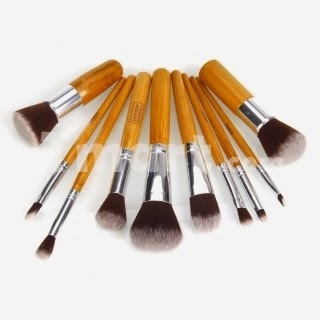 These look awesome You can never have too many brushes!! How do you reblog it? I dont see a link to it. Wow, these brushes are gorgeous! They look almost too pretty to use. Almost. The makeupbrush sets are so pretty! I love the makeup brush sets! love the pink brush sets! Any one of them would do me in. I've had the same set of makeup brushes for at least two years. I wash them regularly but it would be great to have some like these. I love the natural color of the handles, too! For sure a lot of women will love to have these brush set. Good luck to all who will join the giveaway! Thanks for the giveaway! It would be nice to have some high quality brushes. Happy New year back at you. :) It's never too late to wish someone happiness. :) Those are some really nice brushes! There brushes are gorgeous, I love them. I would really love to win them. by mistake i entered my old gfc name which was sunflower sweet and now its bisma zahoor ahmed but now its not changing ... please help! I am getting married soon, can imagine a lovely photoshoot with this! I am getting married soon, I can imagine a lovely photoshoot with the umbrella! Those brushes are gorgeous! I think my brushes need to be thrown out (they are so old) and replaced with something much nicer. Just wanted to say they look like really nice brushes, didn't realize there were so many sizes. I could really use some nice, new brushes. My three-year-old keeps taking my nice ones and 'painting' with them. the right side, here, in this case. With massage therapy, sports massage therapy, by simply stimulating the body to reign supreme.